We are unable to continue our sailing activities. Hence, reluctantly, "Chione T" was sold in April 2018, soon after her 20th birthday. 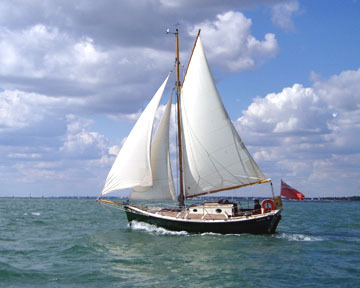 She now has a new owner and has returned to her 'first love' of the Solent. This site remains as an "archive". This site is primarily concerned with our pride and joy: "Chione T "
and the pleasures of sailing a gaffer in the modern world. Ardfern Yacht Centre in Argyll, on the West Coast of Scotland. "Chione T " is a small (LOA = 30 feet), heavy displacement, gaff rigged cutter, launched in March 1998. Designed along traditional lines, with a long keel, but built from modern materials, she retains a distinctive "classic" feel. More specifically, she is a Tradewind Atoll (formerly known as a Tradewind 25) built by MB Yachts of Poole. In summary, she's prettier than a white plastic bathtub, sails better than a country cottage, and will look after you better than your old mum. British Ships Register - Official number = 901053. Old Gaffers Association - Boat number = 1950. A company specialising in the production of modern classic yachts is now building Tradewinds in the Netherlands. To discover more, click the 'Lion Classic Boats' button on the left. ANIMA IV - formerly "Bluey", this boat is now in the ownership of Austrian yachtsman Martin Hammer. Chione & Bluey started their lives side by side in the workshop of Blondecell in Lymington. As Chione's mouldings were being assembled Bluey was in course of completion.